This is a followup to our post highlighting traffic trends during the 2016 holiday season. While there was increased traffic across ecommerce and food-related sites, we noticed that people were also giving this season, with Giving Tuesday marking record online engagement and donations. We worked with our nonprofit customers — including the ACLU — to share how people engaged (and gave) online. Their Facebook followers increased by 25% to nearly one million people. 400,000 people viewed their open letter to President-elect Trump on their website. 150,000 new people have joined their email list. They received roughly 120,000 donations, totaling more than $7.2 million. Giving Tuesday is celebrated on the Tuesday following Thanksgiving, and marks one of the biggest days of the year for donation and charity sites: last year, over 700,000 people raised $116 million in over 70 countries. 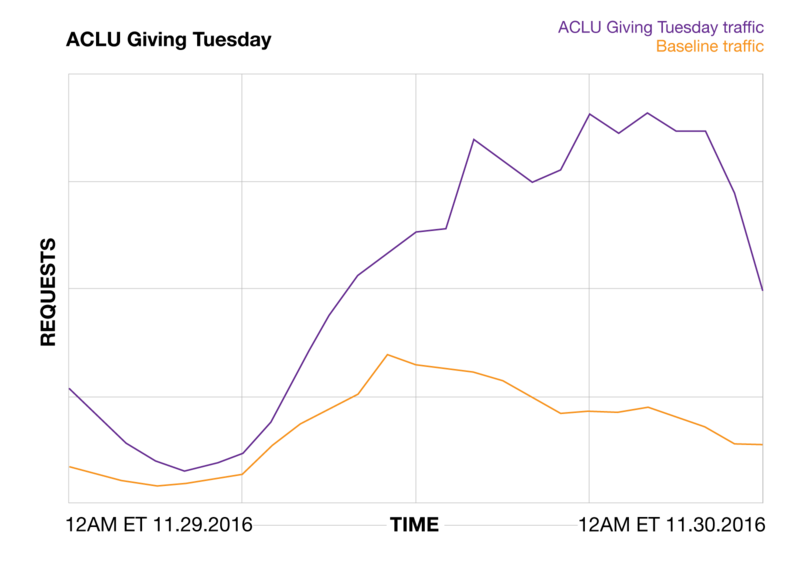 The ACLU matched donations dollar for dollar on Giving Tuesday: they received 20,548 gifts, a 1,495% increase from last year. Donations on 11/29 totaled $1.7 million — up 965% from 2015. 11/29 12:00 AM ET a 212% increase as Cyber Monday came to a close and Giving Tuesday kicked off. 11/29 2:00 AM ET traffic remained high into the early hours, at 165% above normal. 11/29 12:00 PM ET traffic was still up at midday, at 94% higher than normal. 11/29 4:00 PM ET a 204% increase as the day wound down and the gifts rolled in. 11/29 11:00 PM ET traffic peaked at 411% above normal late into the evening. 11/29 12:00 AM ET a 137% increase in traffic as Giving Tuesday kicked off. 11/29 12:00 PM ET a slight uptick at noon, at 68% above normal traffic levels. 11/29 6:00 PM ET traffic jumped by 198% as the workday drew to a close. 11/29 10:00 PM ET a 265% spike as people rushed to get their donations in before midnight. A special thank you to all our customers who worked with us to share these moments of engagement and generosity during the 2016 holiday season. Check out our holiday traffic blog for the full picture of how the internet reacted during the week of Thanksgiving, and keep an eye on our real-time insights — we’ll continue to update it with events into 2017 and beyond.